The former home of internationally acclaimed Cornish writer Jack Clemo has been destroyed by a china clay firm. The revolutionary blind poet died in 1994, having lived in a rented cottage at St Stephen where he wrote some of his finest work. The Goonvean china clay company, which owns the land, has demolished the house for laboratories. It has declined to comment on the subject, while fans of the poet are angry it has been ruined. Mr Clemo, who spent all but the last five years of his life at the cottage, started to go blind at the age of five and by the age of 18 he had lost much of his sight and was beginning to go deaf. However, from small beginnings writing letters to the local paper, his poetry and prose became internationally recognised and in 1951 he won a Festival of Britain prize. 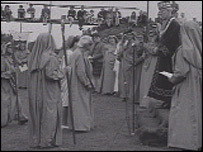 In 1970, he was crowned Poet of the Clay at the Gorsedd - Cornwall's unofficial national assembly - and at the age of 65 he received an honorary doctorate from the University of Exeter. Alan Sanders, secretary of the Jack Clemo Memorial Room at the nearby Trevosa Chapel, said: "On a personal and literary level this cottage was highly important. "I have known this cottage all my life so I am deeply saddened. "A lot of people are still keen on Jack's work and will be very disappointed." Mr Sanders said that the company had ignored requests to keep the cottage, although he accepted it was within its rights and had broken no planning rules in demolishing the cottage . He said: "I can sympathise with it to a certain extent because it had a deteriorating cottage which had been condemned but at least people could go there and associate themselves with the house where Jack lived."